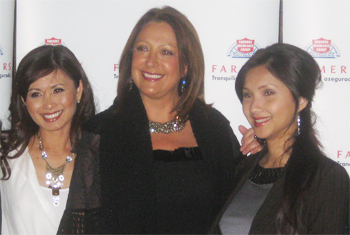 SACRAMENTO, Calif. -- Farmers Insurance honored three exceptional, multicultural women entrepreneurs at The Citizen Hotel Ballroom in Sacramento, California. The honored were: Gia Ly, Kalika Yap, and Dr. Ana Nogales were selected in a statewide competition and were recognized at the evening reception co-hosted by HOPE (Hispanas Organized for Political Equality), and the California Latino Legislative Caucus. One of the women honored is Dr. Ana Nogales, whose tireless work in addressing the issue of human trafficking has resulted in the creation of a website, humantraffickingend.com. In addition, Dr. Nogales wrote a performance play called "Don’t Call Me Baby!," which received critical acclaim and was written to provide therapeutic guidance through theater. "It is structured in a way in which the veracity of human trafficking is not simply revealed, but also given means to a healing end," writes Dr. Nogales. "And while the audience, via the central character, is provided with psychological advice, they are also presented with information on who to contact should they encounter a similar situation. It is a very useful educational piece that can be used at colleges and training facilities, just as well as support groups and prevention programs." Dr. Nogalles immigrated to the United States in 1979 from Argentina, attained her Doctorate degree in psychology and began her private practice in 1982. Establishing Nogales Psychological Counseling, she has become a well-known, respected and much sought after Latina in the U.S. Utilizing media presence and publishing several books, Dr. Nogales has positioned herself as a leader in the Latino community. To learn more about Dr. Nogales' accomplishments visit her websites: casadelafamilia.org, humantraffickingend.com, and ananogales.com. "We, at Farmers Insurance, are fully committed to the empowerment and development of professional, diverse women in the U.S.," said Luisa Acosta-Franco, Vice President of Multicultural Marketing at Farmers Insurance. "The award recipients embody this vision, and I am excited to personally hand them their awards." The two-year old initiative, spearheaded by Farmers, aims to honor a diverse group of women who demonstrate extraordinary success in the areas of innovation, financial performance and personal commitment to their businesses and communities. The hosting committee included Assemblyman Tony Mendoza, Chair of the California Latino Legislative Caucus; Luisa Acosta-Franco, VP of Multicultural Marketing at Farmers Insurance; and Helen Iris Torres, Executive Director and CEO of HOPE. "Farmers has a proud history of supporting local entrepreneurship and has been able to help thousands of women and men across the nation become small business owners," said Mhayse Samalya, president of Farmers Business Insurance and executive vice president of Farmers Group, Inc. "Additionally, as one of the nation's leading insurers of small businesses, we are proud to be able to offer state-of-the-art tools that help entrepreneurs manage their risks so they can focus on assuring their long-term success." Farmers has partnered with HOPE for over 10 years to support a variety of programs dedicated to the growth of Latina leaders statewide. The California Latino Legislative Caucus will also lend its support to the initiative in order to further the groups' aim of increasing the number of successful Latina business owners. "HOPE is grateful to its partners in this initiative," said Torres. "Our organization serves the Latina community with leadership development and is proud that Farmers Insurance and the California Latino Legislative Caucus are helping support this mission as well." Farmers continues to be a leading choice for Hispanics that wish to attain the "American Dream" of owning their own business through its many agency career opportunities. With its statewide network of exclusive agents, who are small business owners themselves, Farmers recognizes the commitment it takes to launch a successful business. 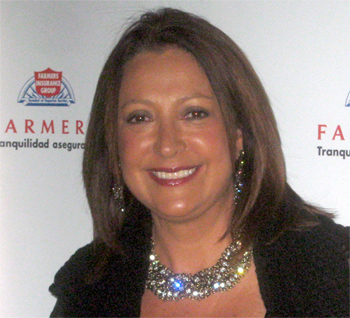 For these reasons, Farmers continues to offer HOPE, the recipients of the 2011 Farmers Insurance Extraordinary Entrepreneurs Award and the Hispanic community at large its continued support. In addition to providing entrepreneurship opportunities for interested individuals, Farmers is one of the largest insurers of small businesses and offers state-of-the-art tools that help entrepreneurs manage their risks so they can focus on assuring their long-term success. The leading insurer of automobiles in California, Farmers Insurance utilizes a statewide network of exclusive agents who are small business owners themselves. The community-based Farmers agents are deeply involved in their local neighborhoods through a variety of activities, including adopt-a-school programs, service club memberships, and small business advocacy to name a few. Farmers is committed to seeking out and providing small business ownership opportunities to talented individuals and offers extensive training and incentive programs to aid in their agents' success. Farmers Insurance Group of Companies is the country's 3rd largest insurer of both personal lines passenger automobile and homeowners insurance, and also provides a wide range of other insurance and financial services products. Farmers Insurance is proud to serve more than 10 million households with more than 20 million individual policies across all 50 states through the efforts of over 50,000 exclusive and independent agents and nearly 24,000 employees. Farmers is a trade name and may refer to Farmers Group, Inc. or the Farmers Exchanges, as the case may be. Farmers Group, Inc., a management and holding company, along with its subsidiaries, is wholly owned by the Zurich Financial Services Group. The Farmers Exchanges are three reciprocal insurers (Farmers Insurance Exchange, Fire Insurance Exchange and Truck Insurance Exchange), including their subsidiaries and affiliates, owned by their policyholders, and managed by Farmers Group, Inc. and its subsidiaries. For more information about Farmers, visit its Web site at www.farmers.com or at www.Facebook.com/FarmersInsurance. Hispanas Organized for Political Equality (HOPE) is the premier Latina leadership, advocacy and education organization in California. They are dedicated to the continuous development of Latina leaders statewide through its different programs and conferences.